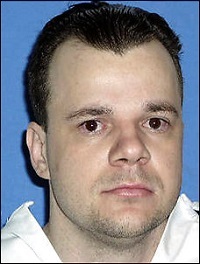 Texas will execute a man who was sitting in a pickup when a murder took place elsewhere. On August 24, 2016, the Texas Department of Criminal Justice plans to inject Jeffery Lee Wood with a lethal dose of pentobarbital to stop his heart. The scheduled execution is Jeffery Lee Wood’s punishment for the 1996 death of a man he did not kill — and, by some accounts, did not know was going to be killed. This is a terrible law, called the "Felony Murder Rule" in states where it applied only to murder. One of the stories that Bill Windsor covered for Lawless America...The Movie is about a young man spending life in prison. He was asleep at home when someone riding in his borrowed car committed murder.